You don’t have to feel stuffed, sick, tired or gain weight during the holidays, and you can enjoy all your favorites. We’ve all been there. The holiday season ends and our pants feel a little too tight. We are sluggish, maybe bloated and can’t look at another turkey, meat pie or dessert again. But it doesn’t have to be this way. We can still enjoy our favorite treats, meats, desserts and holidays treats without the weight gain, and without the food induced coma. 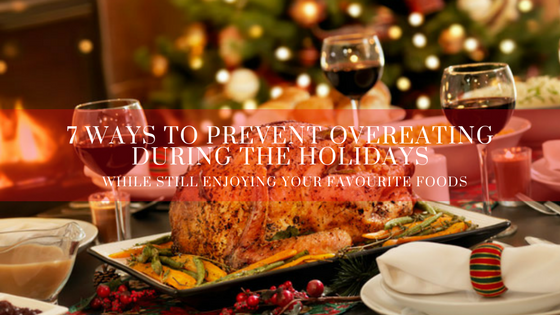 Here are 7 tips to avoid overeating during the holidays. If it is a potluck meal, bring a healthy dish that is hearty and will fill you up even if there are not other healthier options available. You can fill your plate up with your healthy dish and add the other food items in smaller quantities. Remember the small plate rule? Use that when eating out, especially during the holidays. Also, if your family is like mine, they love to see you eat and eat and eat. It is okay to say no to your host when they ask you if you want more. If there is salad being served, fill up on the salad before the main course. Actually, your host will love this because I’ve hosted many dinner parties where no one eats my fabulous salad and I always have to throw out so much of it. Keep your hostess, and hips happy. If there is dessert being served, ask for a small portion. It is also okay to say no, but if you do want to treat yourself, just tell the host that you are so full from their amazing meal, but you would like to taste a couple bites. Take control of the situation and don’t let them choose the size. Or, ask if anyone wants to share a portion with you. You won’t be the only one at the table trying to watch their waste size. Holidays are a great opportunity to slow it down and pace yourself. If you are at a holiday dinner where all the traditional items are being served, load up with vegetables first. Often we do the opposite and then have no room left for the veggies. Start with the veggies and salads. This is also great for the host because they slave for hours making a meal, everyone loads up their plate and the meal is done in five minutes. Take your time and eat in stages, being sure to allow the time for your body to send the signal that it is full. And keep the portions small. Remember, you want to leave room for digestion to take place. This is also a great time to get the family together and go for a walk. After the meal is done, why not try and rally the troops and take a stroll around the block. This will give you the opportunity to mingle with each other, do something different, and you get to burn off some calories. If you are adding meat, keep it smaller, like the size of the palm of your hand or a regular deck of cards. For carbohydrates like potatoes, rice or pasta, try for one 1 cup per meal. When you are mindful of the food you put in your body, you are increasing your brainpower, your energy, and your happiness. WHAT? Food can make me happy? You bet!